The Soyuz TMA-02 mission (No. 702, ISS mission 27S) in June 2011 had a goal of delivering three members of the International Space Station crew, which represented the 28th and 29th long-duration expeditions onboard the orbiting outpost. The Soyuz FG rocket carrying the Soyuz TMA-02 spacecraft lifted off from Site 1 in Baikonur Cosmodrome on June 8, 2011, at 00:12:45 Moscow Summer Time (June 7, 20:12:45 GMT). According to mission control, the spacecraft successfully reached the orbit. 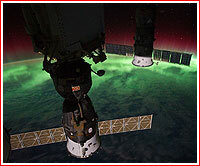 The docking of the Soyuz TMA-02M spacecraft with the space station's MIM-1 Rassvet module was scheduled for June 10, 2011, at 01:22 Moscow Time (June 9, 21:22 GMT). Onboard the station, the crew of Soyuz TMA-02M will join three other members of Expedition 28, who arrived onboard the Soyuz TMA-21 spacecraft in May 2011. On Sept. 16, 2011, with the planned departure of the Soyuz TMA-21 spacecraft and its crew, members of the Soyuz TMA-02M crew would officially become the 29th long-duration expedition onboard the ISS. The same crew was expected to ride the Soyuz TMA-02M on its way back to Earth in November 2011 after 162 days in space. As of October 2009, the launch of Soyuz TMA-02 was scheduled for May 30, 2011, however by the beginning of April 2011, the launch date slipped to the night from June 7 to June 8, Moscow Time. Characteristically, Russian space officials denied multiple unofficial reports about the postponement, saying that all technical information on the preparation of the spacecraft was being still evaluated and the launch date remained unchanged. However, as it happened often in the recent past, the official claims were proven wrong and the launch had to be rescheduled. The Soyuz TMA-02M was delivered to Baikonur on April 19, 2011. By May 5, the integrated tests of the spacecraft had been completed and processing teams at Site 31 started preparations for the fueling of the vehicle. From May 12 to May 16, Soyuz TMA-02M went through vacuum tests in a special chamber at Site 254. On June 9, NASA disclosed two anomalies onboard Soyuz, which in turn, reported by RKK Energia at the beginning of the day. During June 9's rendezvous burn on Soyuz Orbit 17 a lower than expected thrust (~60 percent) was seen in DPO-B thruster No. 14 (nominal thrust: 13.3 kgf). A subsequent test on Orbit 20 confirmed this, and specialists suspected FOD (foreign object/debris), perhaps some shaving, in the prop metering line. Thruster No. 14 acted along x-axis and was also used for yaw control (y-axis). There is no other thruster like this one, but 2 smaller DPO-M thrusters (nominal: 2.7 kgf each) could perform this function independently of No. 14. Because even at 60 percent capacity this thruster still provides more thrust than the 2 smaller ones together, specialists recommend using the degraded engine after uplinking a software patch to extend the range of its allowable burning time (nominal: 400 sec). The software patch would also account for the case of the thruster becoming completely blocked, in which case the system would switch over to a pair of smaller thrusters. If No. 14 should clear, the time range in the s/w patch will allow a return to the nominal configuration. The docking plan was to be modified to account for the decreased thrust. RKK Energia expressed confidence that the docking can still be kept on time, at 5:22 p.m. Eastern US time, NASA reported. The second anomaly were lower than expected CO2 (carbon dioxide) readings of the Soyuz GA (Gas Analyzer) during the first two orbits. On Orbit 3, the data became nominal. Specialists believed that Sokol spacesuit checks prior to liftoff flooded the sensor with O2 (oxygen), suppressing CO2 (the GA in this Soyuz had no screen to protect against this case). Plans were to leave the GA activated for three days after docking to allow specialists to monitor data. Borisenko has turned on the GA on the Soyuz spacecraft from Mission 26S and was to use it with the ISSA GA to compare the readings for accuracy. Despite the propulsion system glitch, Soyuz TMA-02M docked at the MIM-1 Rassvet module on June 10, 2011, around 01:18 Moscow Time (23:18, June 9, GMT), or four minutes ahead of expected time under automated control, as vehicles flew over South America, not far from Rio de Janeiro, Brazil. On Sept. 29, 2011, the ISS was scheduled to conduct an orbit correction maneuver to avoid a fragment of a Tsyklon-3 rocket launched from Plesetsk in December 1991, Roskosmos announced. 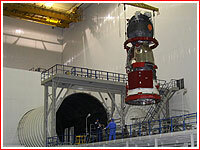 The engine onboard the Zvezda Service Module was to be activated at 20:48 Moscow Time (16:45 GMT) for 169 seconds. The maneuver would increase the station's velocity by 2.7 meters per second and boost the altitude of the outpost's orbit by 4.7 kilometers, reaching 387.1 kilometers. The same engine firing would also fulfill the tasks of a routine orbit correction, which was originally planned for Oct. 6, 2011. As a result, the later maneuver was cancelled. After 165 days in space, hatches between Soyuz TMA-02M were closed around midnight Moscow Time on Nov. 22, 2011. The spacecraft carrying Expedition 29 Commander Mike Fossum and Flight Engineers Satoshi Furukawa and Sergei Volkov undocked from the Rassvet module of the International Space Station on Nov. 22, 2011, at 03:00:08 Moscow Time (at 7 p.m. Houston Time, on Nov. 21). When two vehicles were around 12 miles away from each other, the Soyuz started a five-minute deorbiting burn at 05:32:20 Moscow Time (9:32 p.m. Houston Time, Dec. 21) sending the spacecraft toward its landing at 06:25 Moscow Time on the windy and snow-covered steppes of Kazakhstan under clear sky, some 32 minutes before local sunrise. Two groups of helicopters from nearby towns of Kustanai and Arkalyk lifted soon after the completion of the deorbiting burn to provide search and rescue for the crew. After few-minute long interruption in communications between the descent module and ground control, the crew then reported a normal reentry. The opening of parachutes was confirmed around 06:12 Moscow Time, some 12 minutes before the scheduled touchdown. Recovery teams saw Soyuz around 06:22 Moscow Time. The Soyuz TMA-02M landed as scheduled around 06:26 Moscow Time on November 22, 2011, (8:26 p.m. Houston Time, Nov. 21). The descent module landed on its side, probably as a result of windy conditions. By 06:39 Moscow Time, NASA TV was already showing the process of extraction of the crew from the descent module. Expedition 30 Commander Dan Burbank and Flight Engineers Anton Shkaplerov and Anatoly Ivanishin remained onboard the station. 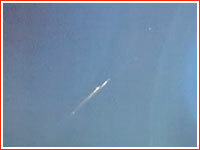 They had a rare opportunity to see and film the fiery reentry of Soyuz TMA-02M into the atmosphere. A new trio of Expedition 30 flight engineers – NASA astronaut Don Pettit, Russian cosmonaut Oleg Kononenko and European Space Agency astronaut Andre Kuipers – was slated to launch from the Baikonur Cosmodrome in Kazakhstan next month aboard Soyuz TMA-03M. April 19, 2011 Baikonur Soyuz TMA-02M delivery to Baikonur. 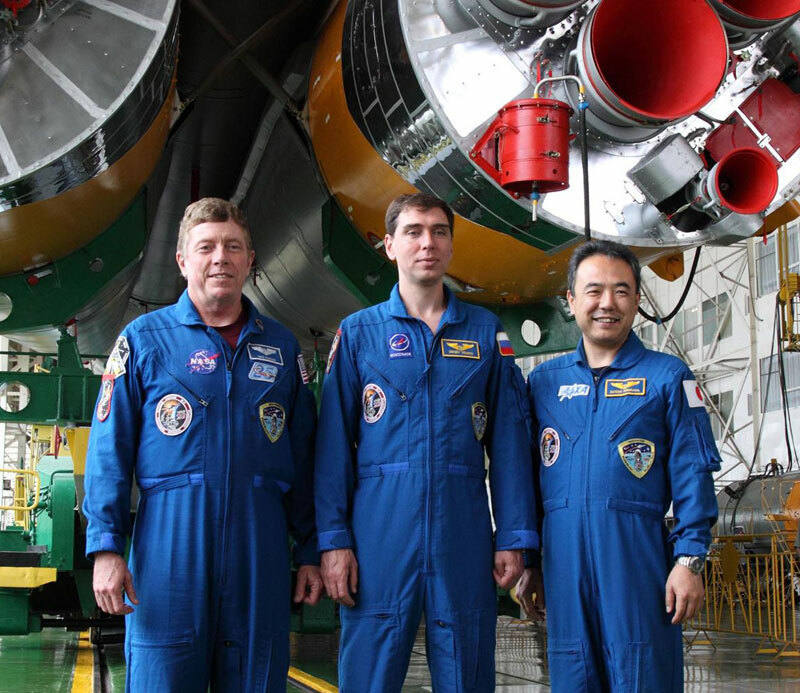 May 5, 2011 Baikonur The completion of integrated tests. May 12-16 Baikonur, Site 254 Vacuum chamber testing. May 25 Moscow-Baikonur Soyuz TMA-02M main and backup crews travel to Baikonur. 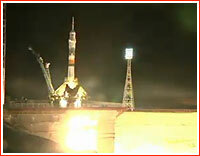 May 28 Baikonur, Site 31 Completion of Soyuz TMA-02 fueling. May 30 Baikonur, Site 254 Soyuz TMA-02M integration with the launch vehicle interface ring. June 1 Baikonur, Site 254 Soyuz TMA-02M integration with the launch vehicle payload fairing. June 2 Baikonur, Site 254 Installation of the stabilizers of the Emergency escape system on the Soyuz TMA-02M payload fairing. June 3 Baikonur, Site 254 A second familiarization training of the Soyuz TMA-02M crew onboard the spacecraft. June 4 Baikonur, Site 112 Integration of the Soyuz TMA-02M spacecraft with the launch vehicle. June 5 Baikonur, Site 1 The rollout of the Soyuz-FG rocket with the Soyuz TMA-02M spacecraft to the launch pad.